Предрождественская пора — четыре долгие, сумрачные недели. Особенно невыносимо ожидание для детей, они то и дело спрашивают: Сколько же еще осталось ждать? Сколько раз еще нужно проснуться, чтобы Рождество наступило? Поэтому появился рождественский календарь, с помощью которого каждый ребенок с 1 декабря до сочельника, может постепенно отсчитывать 24 дня, а если он еще не умеет по-настоящему хорошо считать, то может увидеть приближение Рождества собственными глазами. Существуют разные рождественские календари. Например, на одном из них вы каждый день можете прибавлять по одной фигурке к пейзажу с яслями: пастухов, овец, наконец, поместить Марию и Иосифа, а в последнюю очередь — младенца в яслях. Либо у вас может оказаться Рождественская картинка, на которой каждый день открываются ставни окошка: за ставнями виднеется другая картинка, например, ангел или игрушка. Это продолжается до тех пор, пока не будут открыты все ставни. В последнем окне появится Рождественская звезда или младенец. Одним из излюбленных Рождественских календарей является следующий: длинную веревку натягивают поперек комнаты, на нее вешают 24 маленьких пакетика, и уже до Рождества вы каждый день получаете подарок. Рождественский календарь в виде лестницы на небо, вероятно, происходит из женских монастырей Баварии: из бумаги или дерева вырезают или выпиливают лестницу с 24 ступенями, на которую ставят маленькую фигурку ребенка или ангела. Наверняка каждая семья готовит такую композицию из картона, раскрашенного как звездное ночное небо. Декорация украшается фигурками: маленькими ангелами, держащими свечи, лесными зверями или деревьями. Каждое утро дети могут переставить фигурку на одну ступень ниже, пока она не спустится вниз. Это значит наступило Рождество. An advent calendar shaped like a Christmas tree. This article is about the holiday tradition. For the PBS holiday special, see A Christmas Calendar (TV special). An Advent calendar is a special calendar which is used to count or celebrate the days of Advent in anticipation of Christmas. Some calendars are strictly religious, whereas others are secular in content. Today, most advent calendars are made for children. Many take the form of a large rectangular card with many «windows», one of which is opened every day during Advent. In less elaborate calendars, each window opens to reveal an image, a poem, or part of a story such as the Nativity story itself. 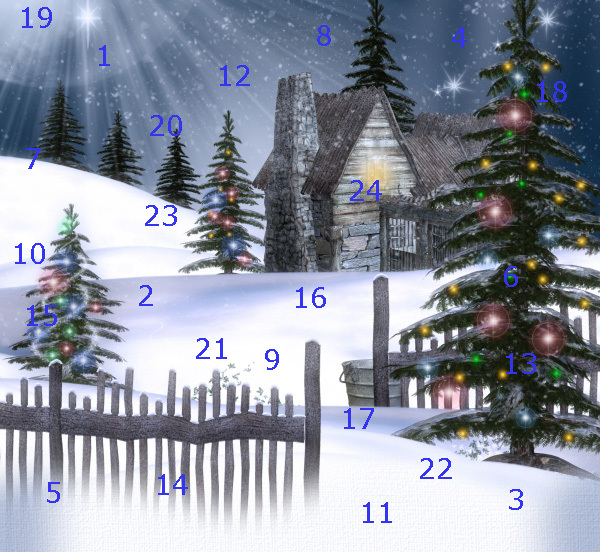 More elaborate Advent calendars have a small gift concealed in each window, such as a toy or a chocolate item. The origins of the Advent calendar come from German Lutherans who, at least as early as the beginning of the 19th century, would count down the 24 days of Advent physically. Often this meant simply drawing a chalk line on the door each day, beginning on December 1. Some families had more elaborate means of marking the days, such as lighting a new candle (perhaps the genesis of today’s Advent wreath) or hanging a little religious picture on the wall each day. The 24 candles might also be placed on a structure, which was known as an «Advent clock». In December, 1839, the first verifiable public Advent wreath was hung in the prayer hall of the Rauhes Haus (relief house) in Hamburg, although it had been a family practice in parts of German-speaking Europe since the 17th century. The first known Advent calendar was handmade in 1851. 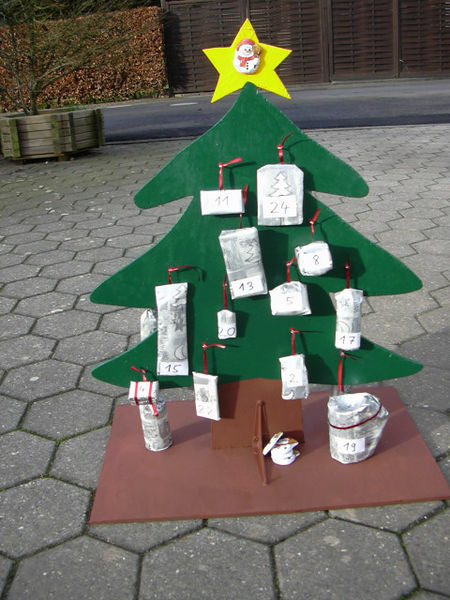 According to the Austrian (NÖ) Landesmuseum, the first printed Advent calendar was produced in Hamburg in 1902 or 1903. Other authorities state that a Swabian parishioner, Gerhard Lang, was responsible for the first printed calendar, in 1908. Lang was certainly the progenitor of today’s calendar. He was a printer in the firm Reichhold & Lang of Munich who, in 1908, made 24 little colored pictures that could be affixed to a piece of cardboard. Several years later, he introduced a calendar with 24 little doors. He created and marketed at least 30 designs before his firm went out of business in the 1930s. In this same time period, Sankt Johannis Printing Company started producing religious Advent calendars, with Bible verses instead of pictures behind the doors. The practice disappeared during World War II, apparently to save paper. After the war, Richard Sellmer of Stuttgart resurrected the commercial Advent calendar and is responsible for its widespread popularity. His company, Richard Sellmer Verlag, today maintains a stock of over 1,000,000 calendars worldwide. His company has now been established as one of the biggest sellers of advent produce. Other companies such as Cadbury’s who specialise in the making of calendars have similar stocks, if not higher. The traditional calendar consists of two pieces of cardboard on top of each other. Twenty four doors are cut out in the top layer, with a number ranging from one to twenty four on each. Beginning on the first day of December, one door is opened each day, counting down the days remaining until Christmas Eve, from twenty four to one. Each compartment displays an image, which can be either a feature of the Nativity story and the birth of Jesus or a piece of paraphernalia to do with Christmas (e.g., bells or holly). Advent calendars can also consist of cloth sheets with small pockets to be filled with candy or other small gift items. Many calendars have been adapted by merchandisers and manufacturers to include a piece of chocolate or other confectionery behind each compartment. These are often aimed at children who are counting down to Christmas and the arrival of Santa Claus, and have often been criticised for not relating to the Nativity and simply cashing in on Christmas sales. Like the annual LEGO Advent Calendar has 24 doors with LEGO pieces behind each. The number of doors can also increase to twenty five or twenty six to cover Christmas Day, Hanukkah and Boxing Day, and further to thirty one or thirty two to include New Year’s Eve and New Year’s Day. This latter act was particularly evident over December 1999, counting down to January 1, 2000. The Advent calendar is normally shaped like a large greeting card, but it can be found in other shapes, such as a three-dimensional model of a house or church. There are alternative forms of Advent calendar, such as those made from felt or other material, or a chain of candles that can be lit day by day. The German city of Dresden has a giant calendar built into a fairytale castle on its Christmas market, the Striezelmarkt. Nowadays there are also digital Advent calendars. In Norway,Denmark, Sweden and Finland there is also a tradition of having a so-called Julekalender (Swedish: Julkalender) in the form of a television show starting on the first of December, and ending on Christmas Eve. The Julkalender was first aired on Swedish TV in 1960 with the program Titteliture. The first Julekalender aired in Denmark was Historier fra hele verden in 1962. The televised jul(e)kalender has now extended into the other Scandinavian countries. In Finland, the show is called Joulukalenteri. Over the years, there have been several different kinds of julekalender; some directed at children, some at both children and adults, and even some directed at adults alone. A classic example of a Julekalender enjoyed by children (as well as adults, if purely for nostalgic reasons) is the show Jul i Skomakergata. A more modern version of the Julekalender is the show The 24th, which is a parody on the popular american series 24 starring Kiefer Sutherland. In Gengenbach, a town in Germany’s Black Forest, the Rathaus (town hall)—which fortuitously has 24 main windows—is turned into a giant Advent calendar each year. An artist, often an illustrator of children’s books, is invited to set a scene or painting in each of the 24 main windows. These are unveiled one by one, beginning on the evening of November 30. The town of Reith (near Kitzbühel) has a similar tradition; however, each one of the 24 windows in its «walking Advent calendar» is located in a different building. Hand made Advent calendars have become popular projects with craftpersons and artisans of all types. Today, we see hand made creations made from various media — including fabric, felt, paper, chipboard, small boxes, etc. The concept of the Advent Calendar has recently broadened to include «Countdown Calendars». These are calendars suitable for persons from all faiths, and can be used to count down to any event imaginable — birthdays, Easter, Halloween, graduation, last day of school, retirement, etc.